Every Friday, I go out to eat with my coworkers. We pick a restaurant in the Peninsula, eat there, and rate it on a scale of one-to-5. This week, we had the opportunity to try out Kobe Japanese Cuisine and Bar in Foster City. It’s located in the same complex as some of my favorites such as Waterfront Pizza and Plaza Gourmet. I found this place to be perfect for a business lunch. Also, if they moved the tables, it would have been perfect for a party with a bar. The decor is trendy Japanese restaurant. Parking is super easy since this is within a shopping complex. Since this was my first time here, I decided to try something special from the menu. Kobe has bento boxes, sushi rolls, and noodles. What I found interesting was something that was called Hwe Deop Bap or Sashimi Salad over Rice with Special Spicy Sauce. When I was ordering it, the waitress mentioned that this was really good as long as I liked fresh fish. Wow! I was already getting pretty hyped up about it. When the dish came, it was literally a salad on top of rice. 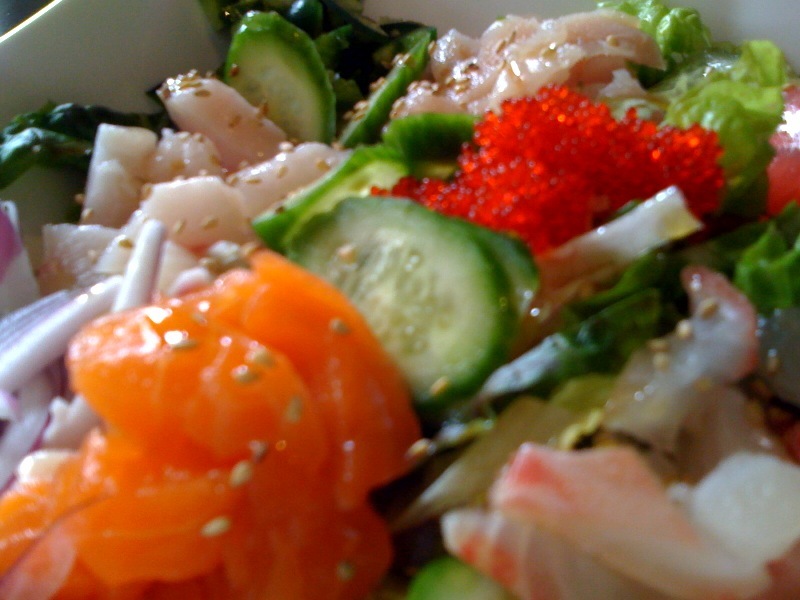 On top of the salad was 5 different types of fish, Tobiko, sliced red onions, pickled garlic, and sliced cucumber. I was told to mix the dish together and enjoy. So, I did that. I found that the sashimi salad was a bit bland and needed a little something. The waitress ran over and said, “Did I forget the sauce”? So, the sauce is the Korean Sour and Spicy Sauce that’s used in everything. Bottom line, the sauce rocked this dish like no other. I loved it! For $14, you get a salad, miso soup, and this dish. Want to try making it for yourself? Make the Jump! Cut fish into small pieces. Wash vegetables and prepare as instructed above. Most of them are just thinly sliced. Mix “Cho Kochujang (sweet and sour chili sauce)” ingredients, set aside. In a large bowl, put rice on the bottom, spread lettuce and salad greens. Arrange rest of the vegetables, add fish, and spoon smelt roe on top. Drizzle 1 tsp sesame oil over each serving. Serve with cho kochujang (sweet and sour chilli sauce). I like to serve garlic and chilies in a separate bowl, so everybody can add to taste.